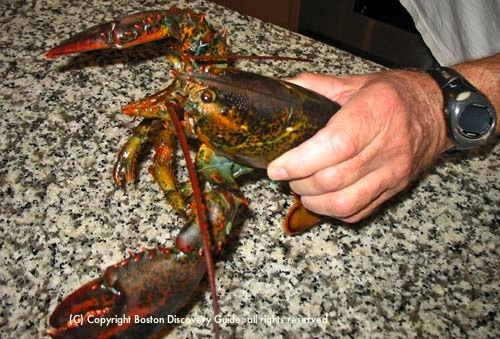 If you enjoy eating boiled lobster in Boston's seafood restaurants, you may want to learn how to boil lobster at home. It's so simple that if you can boil an egg, you can boil a lobster. And once you do, you can enjoy this favorite staple of New England cuisine with drawn butter, or even make lobster rolls. 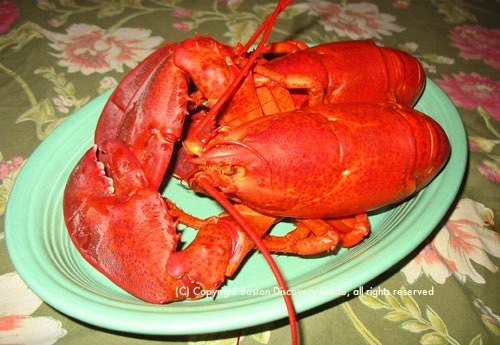 Most of the lobsters eaten in Boston are actually Maine lobsters. The cold northern New England coastal water makes the meat especially sweet and succulent, and the rocky ocean bottom just off the Maine coast provides plenty of excellent habitat. Lobsters must be bought live, and kept alive until you're ready to cook them. The best place to buy them is straight from the dock, or a lobster pound or fish market that gets them daily from lobstermen and keeps them in salt water tanks. Put the lobsters into the refrigerator as soon as you get home, and cook them as soon as possible. This is one of the most important things to remember about how to boil lobster successfully - start with one that's fresh! If you can't buy fresh lobsters locally where you live, you can get live Maine lobsters delivered to your door (if you live in the continental U.S.) by companies that buy lobsters directly from the docks and use overnight delivery services to ship them to you. Because they ship immediately, they're a better bet than supermarket lobsters, which are usually handled by 3 - 4 middlemen and can spend days in transit getting to the store. Although boiling lobster is easy, you want them to be tender, not tough - so you must master one key skill: don't overcook them! If you accidentally undercook the lobsters, you can always heat them up a little until they're perfect. But if you overcook - well, they're tough and rubbery, and there's nothing you can do about it. Remember, even after you remove the lobsters from the pot, they'll continue to cook a bit as they cool down. To avoid this result, fill a bowl with water and ice, so that you can plunge the lobsters into it to stop the cooking process if necessary. However, as long as you keep an eye on the clock while the lobsters cook, you don't need to worry too much . . . even if you cook them a few minutes longer than necessary, you probably won't notice much difference in the delicious results. 1. Fill the pot about one half to two thirds full of water, so that after you put in the lobsters, they'll be completely covered. If you use sea water, you don't need to add more salt. But if you used regular water, add about 1/4 cup. Some people like to add a few lemon slices, or a cup or two of wine or beer, or even herbs such as thyme or bay leaves to the cooking water to add flavor to the lobster meat. I usually add a piece of seaweed (or dried Japanese kombu) because I like how the seaweed enhances the briny flaver. You should experiment to discover what you like best. Turn on the heat and bring the water to a vigorous rolling boil. 2. Pick up the lobster by holding the upper side of the lobster's back between your thumb and fingers. 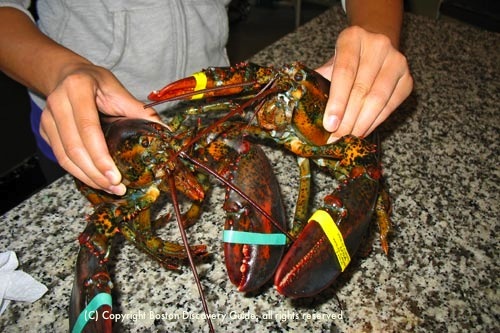 With your other hand, use the sissors to clip off the bands around the lobster's claws. Hold the lobster so that its underside is away from you so that it won't flip its tail and splash you with scalding water. Drop it head-first into the boiling water. 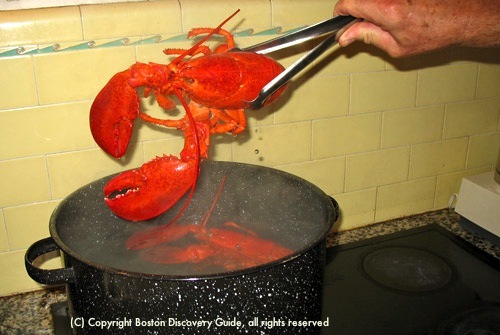 If you're boiling additional lobsters, drop them into the pot quickly. Cover the pot with a tight-fitting lid so that the water will come back to a boil as soon as possible. Note the time. 3. 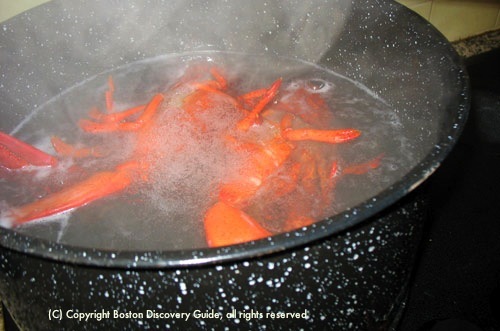 Once the water returns to a boil, uncover the pot so that you can monitor the color of the lobsters. You may want to turn down the heat slightly, but make sure the water continues to boil. Whether you're cooking one or more lobsters, use these times. As long as the water's boiling, cooking time is based on lobster size, not the number of lobsters. While the lobsters cook, melt some butter in a small sauce pan. 4. When the lobsters turn bright red all over, they're done. Making sure that they're completely red can the trickiest part of mastering how to boiled lobsters due to all the steam that the boiling water produces. If in doubt, cook them for one more minute. Some chefs believe that when you can pull out the antennae easily, the lobsters are ready, but this is not always reliable. Use the tongs to remove the lobsters from the water. If you're worried that they're undercooked, pull off a claw or one of the small legs and check the color of the lobster meat. It should be opaque white, with no translucent areas. If it's not, pop the lobster back into the boiling water for another minute or two. 5. Drain the lobsters in a colander or on paper towels. Serve warm with melted butter. Not sure how to dismember the creature on your plate? Check out our instructions for how to eat lobster. If you're cooking several batches of lobsters, consider using 2 or more pots. Otherwise, wrap the ones that you've already cooked in a clean dish towel or aluminum foil to keep them warm. If you're cooking more than one lobster, make sure they're all about the same weight, since this determines how long you'll cook them. If you hear a high-pitched sound as the lobster is cooking, do not be alarmed or worry that the boiling lobster is somehow expressing outrage at its fate. This sound is actually from gasses being released from under the lobster's shell. And conversely, if you don't hear this sound, don't worry that you're cooking bad lobsters - this sound doesn't always occur. Some people feel that boiling a live lobster is cruel, and killing the lobster immediately before cooking is more humane. The usual way of doing this is to stab the lobster in the head. I do not recommend this because it releases a lot of proteins into the water, which then coagulate due to the heat and ruin any roe. 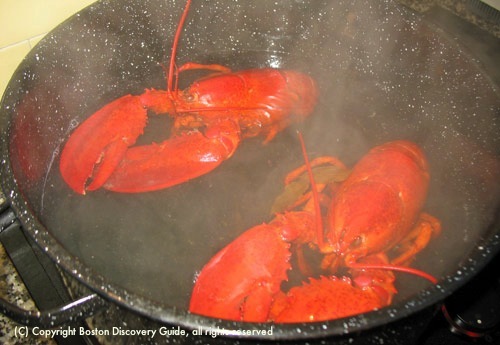 If boiling live lobsters bothers you but you still enjoy a lobster dinner, you may feel much happier if you make reservations in one of Boston's excellent seafood restaurants or get boiled lobsters shipped to your door. Best Boston seafood restaurants - for when you don't feel like boiling or steaming but just want to eat!